It is a well- known fact that Dr John H F Smith was instrumental in setting up the former Sheffield Cytology Training Centre. 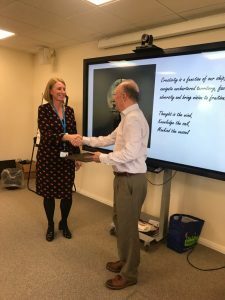 He guided the training centre through many a change, including the merger with Northern & Yorkshire CTC to become East Pennine CTC, and then to morph into what it is today as NEPSEC. 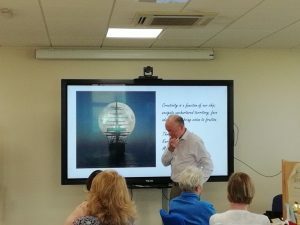 Now as he leaves Sheffield Teaching Hospitals and NEPSEC to take the more leisurely path of retirement, the team celebrated his contribution to cytology education, as well as that of Nick Dudding and Christine Kempster who also take their retirement. 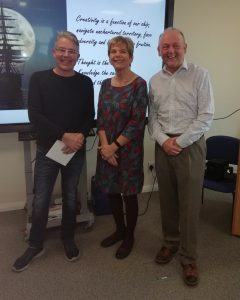 On 1st April 2019 NEPSEC hosted a retirement celebration for the three well-loved members of the team and gave a presentation with a twist, likening the life and times of the cytology training centre to a Pirate Ship for which John was the Captain, Nick was First Mate and Chris a Sailing Master. The pirate story was well received by the invited guests and Dr Smith was clearly moved by the sentiment as he gave a short speech of gratitude. Alison Cropper, Chairman of the British Association of Cytopathology, also took the opportunity to present Dr Smith with his honorary life-long membership to the BAC for his long service to cytology and education, as well as in recognition of his part in the merger of National Association of Cytology and British Society for Clinical Cytology. Both Nick and Chris were surprised and grateful for their service to be reflected in the celebration. We will miss Nick and wish him well, though we will look forward to welcoming Chris back to assist with trainee progress for sample taker training from May 2019. It is with a heavy heart that the remaining crew sail forth into the unknown without John and Nick, but we wish them well and look forward to hearing from Dr Smith about his Afternoon Tea Experience and trip to Lord’s Cricket Ground, which was purchased from the kind donations received for his retirement gift. Nick received some Great British Pub vouchers and Chris received a Pandora shamrock pendant and chain. All were sent away with a Retirement Survival Kit. John, Nick and Chris… Thank you, from the bottom of our hearts!